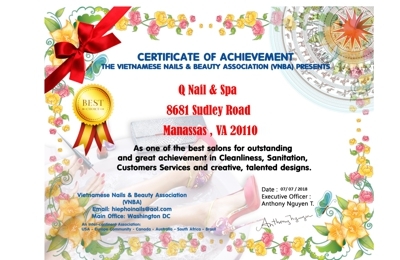 Vietnamese Nails & Beauty Association (VNBA) proudly presents Q Nails & Spa as one of the Top Best Salons for best sanitation , perfect cleanliness , professional services and very impressive , talented designs ! My manicurists did an amazing job. My nails stayed looking freshly done for at two weeks, which is a big deal concidering how often I knock my nails into things on a daily basis. They were very friendly and accomodating. They have a clean, nice set up. The salon here gives great service, and the spa chairs are very new and clean. I come here once every two weeks. (: I'd recommend you try! This shop is very clean, their services is wonderful, the workers are nice, friendly and do fantastic jobs on my nails. I will try to go here twice a month. My friend and I had a full set of nails service, a complete massaging with only $60.00, an affordable price.. They are friendly and open-minded, ready to serve you as they can. My friend and I will be there every month, as well as my mom with her 10% senior citizens discount. We recommend you to try..